Many visitors to Phi Phi will be surprised at the social scene and nightlife of Phi Phi Island bars. Besides great restaurants and recreational activities, Phi Phi Island bars are hot hangouts that offer music and entertainment. You can even catch the occasional boxing match or relax in front of Satellite TV for a football game at one of the many Phi Phi Island bars. Of all the Phi PhiIsland bars, Phi Phi Reggae Bar is the perfect hang-out for people who want to unwind after a long day combing the beach, sunbathing, kayaking or shopping. At Phi Phi Reggae Bar, you can grab a drink, listen to music and dance the night away. Enjoy recalling the day's adventures and share your experiences with other tourists and friends. Phi Phi Island bars are the perfect end to a busy day. Phi Phi Reggae Bar has 5 separate bars run by friendly and enthusiastic bartenders, a dance floor, pool tables and Satellite TV. Expect a loud, excited atmosphere and Island drinks galore! Phi Phi Reggae Bar sets itself apart from other Phi Phi Island bars in that it is incredibly spacious and offers unique entertainment every day of the week. Phi Phi Island bars are some of the best places to meet new people and you can do just that at the Phi Phi Reggae Bar. When other Phi Phi Island bars close their doors, Phi Phi Reggae Bar remains open and jumping with action. If what you yearn for is an evening of fun and animated activity, look no further than the Phi Phi Reggae Bar. After all, what would a holiday be without Phi Phi Island bars to melt away the stress and anxieties of everyday life? 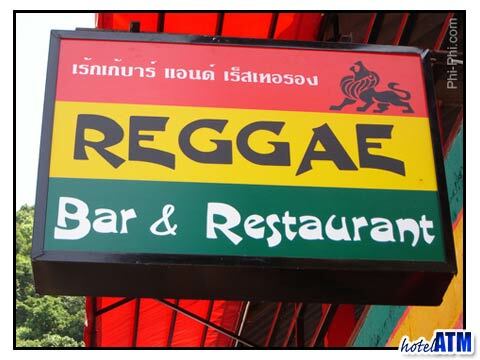 Fabulous music isn't all you'll find at Phi Phi Reggae Bar. As with many Phi Phi Island bars, you will have the opportunity to see live entertainment, watch television with sports fans, and get your groove on. Dancing is a great way to release the tension of travel and get you socially acquainted with the Island. Phi Phi Island bars are also great places to gather activity ideas from other travelers. While staying on the Island, you will most likely stop in to many Phi Phi Island bars, though if you're like most visitors, Phi Phi Reggae bar will certainly become your favorite!